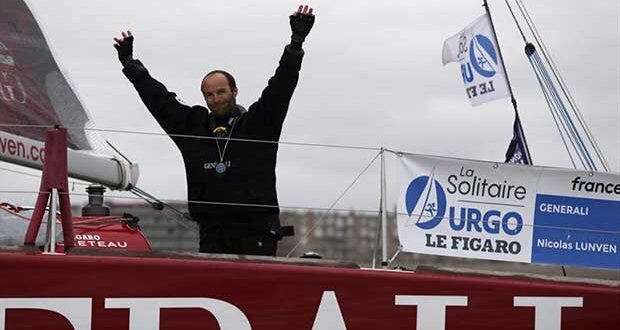 This morning at 08:11:56 it was Macif 2015 skipper Charlie Dalin that crosses the finish line of the 4th and final stage (Concarneau-Dieppe) of the 2017 La Solitaire URGO Le Figaro. Taking 3 days 17 hours, 4 minutes and 56 seconds to complete the 505-mile course navigating the Wolf Rock lighthouse and the English coast at an average speed of 5,67 knots. At two o’clock this morning, the fleet sailed downwind in 20 knots of wind along the cliffs of the Alabaster coast. Upon passing the last mark of the course ‘Antifer’ at 2:40am it was Alexis (Custopol) who held the lead. With a dense race full of twists and turns, Alexis had taken the lead several times, especially when passing the island of Sein and before the Four channel, is winning his bet. Loison opted for the more offshore route once passing Antifer with Charlie Dalin (Skipper Macif 2015), Sebastien Simon (Bretagne – Credit Mutuel Performance), Thierry Chabagny (Gedimat) and Nicolas Lunven (Generali) all opting for the more Southerly inshore route with a more favourable angle into the finish in Dieppe. At the end of a complicated stage rich in twists and turns, wind-free areas along the Breton coasts, two express crossings of the Channel and a very technical route between Wolf Rock and the Isle of Wight, Charlie Dalin has showed an incredible tenacity taking the stage in the final miles. Sébastien Simon (Brittany-Crédit Mutuel Performance) crossed the line in second position 3 minutes behind the leader Dalin. In third Thierry Chabagny, Gedimat another minute behind Simon. 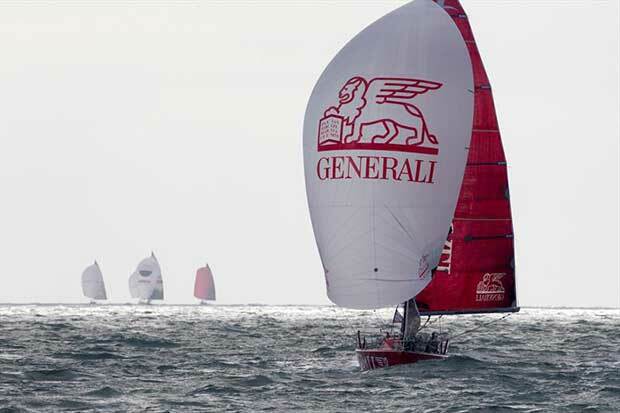 With Generali skipper Nicolas Lunven sailing an impressive final stage he finishes in between Custo Pol and Skipper Macif 2015 taking 4th place sealing victory in this 48th Solitaire URGO Le Figaro. This will be Lunven’s second victory in 8 races and in the same port as in 2009 which will no doubt make sense for the interested party as Nicolas Lunven returns as the winner in the port of Dieppe this morning. For the rookie prize how better to celebrate his 32nd Birthday than to win the Solitaire du Figaro? The cake will have a special flavor for Julien Pulvé who takes the Rookie prize. He revealed his skills between Concarneau and Dieppe, taking control after Cape Lizard and showing that he is still able to emerge in the top ten. Throughout the morning the remainder of the fleet will continue to arrive into Dieppe, all skippers will be relieved that this long testing stage is over but no doubt emotional at the reality the Solitaire 2017 is complete.